The race was full of drama from beginning to end but Stafan was untroubled by the events unfolding in midfield, going on to take victory ahead of the newly crowned champion Martin Byford. 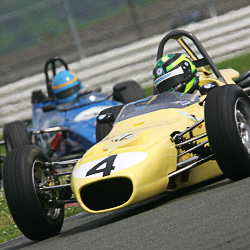 After a dominant season Callum MacLeod was finally crowned the 2007 British Formula Ford Champion at Brands Hatch in Kent on Sunday. It was a tough weekend for Formula Ford Championship leader Callum MacLeod and despite some setbacks, the 19-year-old left Croft with a very healthy 82-point lead with two more events to go. Darren Manning drove the ABC Supply Dallara/Honda to a fourth place finish in the Detroit Indy Grand Prix at Belle Isle.